Yes - I want to get more out of HubSpot. Simplify and Streamline Your Inbound Marketing. HubSpot lets you create and manage every component of a marketing campaign in one user-friendly and intuitive tool. 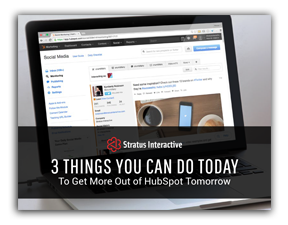 Our new guide, “3 Things You Can Do Today To Get More Out of HubSpot Tomorrow,” will show you how you can use HubSpot to squeeze the most ROI from your inbound marketing efforts. Fill out the form to download - it's free.